What is this? A never-before-seen Nokia Lumia smartphone? Well, it seems so, but we still don't know any specifics about it. As a matter of fact, this might even be a photo of an old prototype model that might never see the light of day, but let's be a bit more optimistic - it might also be a perfectly legit model scheduled for release in the not that far future. It's assumed that this is a Windows Phone 8-running device, judging by the presence of the Family Room live tile, which is most encouraging. If we take an even closer look at the photo, we'll notice a bottle of water in the background with the word "Pure". Now, we're usually not the ones who'd get too absorbed in thoughts of such conspiracy stuff, but hey, when there's also a Lumia in the picture, the logical thing to come to mind is that it may have some sort of PureView technology! As we said, nothing is known about this model yet, but it does seem to have a relatively large screen, although we can't be super-sure just by looking at this pic. Looks like a prototype. The bezel is too big. Exactly. There's so much bezel and the phone is large but certainly not the screen. Looks like a 4 inch screen. Isn't the logo old? Prototype of the 710 I reckon. 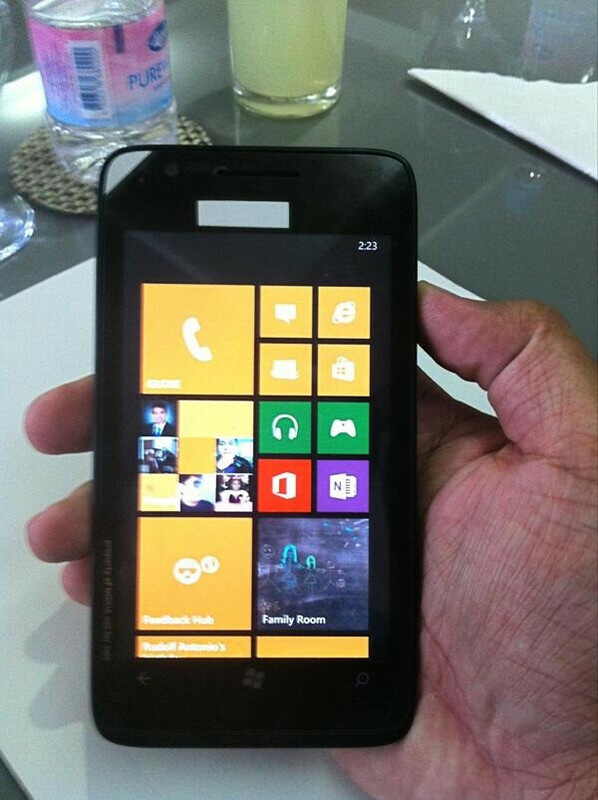 Nope, this is probably a WP7.8 device judging from the Windows button. WP8 devices all have the Windows 8-alike icon on the button. Click the source, it's a WP8. Good call. Probably an old WP7 prototype. Nokia should avoid making it anyways... one ugly phone. Looks like an 820/22/10 prototype with a large bezel, and the hand in the picture looks old. Without a scale in the picture, hard to say. I hope it's true. My wife got a GS3 from work this week and after playing with it, 4.7-4.8" feels nice, but I am used to 4.3" on my Lumia 900. A slightly thinner and lighter 920-evolution with a larger screen and smaller bezel would be very interesting if it were as durable as the 920. I don't mind the 920's bulk, but it wouldn't be a bad thing for it to lose weight. it's a prototype folks old or new I like the fact it does not have sharp corner like on Nokia lumia 920 which I will get soon but I may wait to see what Nokia brings out at CES they may bring out a 5 inch hd screen dual lumia 1000. yeah Nokia bring it on I would buy one. How come its considered a Nokia..? I dont see a nokia logo or app.. add to that the speaker looks HTC. In any case think its a older prototype. Ray forgot to mention that it's running Windows Phone 8.
this phone is a midrange phone at best. for one it doesnt have a polycarbonite body that the lumia 900 series do. also looking at the screen resolution, it is 800x600. also it is using an old windows logo as the windows button, but that could also be to just throw off anyone from thinking it's a prototype. might be the galaxy note 2 competitor on the works! Too small... unless dude has huge hands. thats a 7.8 phone look at the windows logo! and why is that we are so certain that this is a NOKIA?? Well, PA, since you think you are smarter than real experts working in real companies, you tell us what this could be? :) C'mon! We all know you are smarter than HP, Nokia and Apple's engineering and marketing teams put together, so go on, tell us.